The common eland with its spiraled horns is just as large as a moose, but that is about the extent of how similar they are to each other. Moose have antlers, which they shed seasonally, as do true elk and deer species---the other members of the family Cervidae. With the exception of caribou, antlers are found only in male cervids. The horns of bovids, on the other hand are permanent unbranched, bony structures extending from the frontal bone of the skull. These bony cores are covered in keratinized sheaths and occur in all shapes and sizes depending on the species. We typically don't associate antelope with wetlands, but the black lechwe, one of three living subspecies of lechwe, are found nowhere else in the world, but in the Bangweulu swamp, and more specifically, the Bangweulu Game Management Area (GMA) in northern Zambia. Bangweulu translates to 'where the water sky meets the sky'. Similar to other GMA's, the Bangweulu Game Management Area is intended to serve as a buffer zone around an adjacent national park or protected area. As a GMA, the Bangweulu Game Management Area is essentially owned and managed by a rural community, whereby village residents are incentivized to sustainably live off the land. Fed by 17 rivers, Lake Bangweulu is a 3,000 square kilometer body of water, which overlaps the country's Northern and Luapula Provinces. Both provinces lie within the upper Congo River Basin. With its associated swamp lands and surrounding floodplains, the Bangweulu wetland system is comparable in area to the state of Connecticut. This makes the Bangweulu one on the world's largest and most important wetland ecosystems. The Bangweulu swamp, itself, covers an area three times the size of Lake Bangweulu (9,000 square km). Its primary ecosystem service is to prevent the Luapula valley from flooding during the rainy season. Droughts and disturbances to the natural flood cycle along with intensive poaching have lead to the decline of black lechwe in the western portion of the swamp, but populations in the central and eastern regions of the swamp appear to be stable or increasing. For lechwe, which are not inherently fast antelope, living in swampy habitat provides sustenance in the way of aquatic plants. Furthermore, inhabiting areas with high-standing water makes it difficult for lechwe predators to make a kill. According to the International Union for the Conservation of Nature, black lechwe populations have fluctuated throughout the latter half of the 20th Century and have since stabilized to around 30,000 individual animals. Roberts' lechwe once occurred in Zambia and are now presumed extinct or functionally extinct. The two other living lechwe subspecies continue to occur in parts of their historic range. 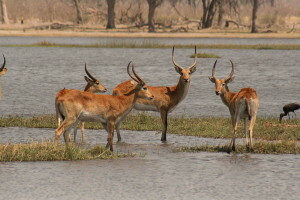 The Kafue flats lechwe are now restricted to Zambia, while red lechwe are found in fragmented populations in Zambia, Zimbabwe and Botswana. Rather than defend harems, guard large territories holding resources such as foraging grounds, or exhibit dominance hierarchies, lechwe may indulge in what zoologists call lekking or arena behavior. Lekking occurs when the males organize into small clustered territories, which they vigorously defend during the main rutting season as females gather in these communal areas. South Luangwa National Park may be known for hippos, elephants and crocodiles, but it is also home to a number of large predators and a great assemblage of antelope, including waterbuck, hartebeest, impala, puku, eland and, of course, red lechwe. We expect that on safari, you will get a chance to see numerous and diverse species of antelope in addition to the better known and higher profile species here in Zambia. Hatching at a length of 2 ft and growing in excess of 20 ft (6 meters) the African rock python is Africa's largest snake and one of the five largest snakes on the planet. It is up there in size with the green anaconda, the reticulated python, the Burmese python and the amethystine python or giant scrub python---Australia's largest snake. In fact, it is only shorter in length than the reticulated python. Not only is it big, but some, including professional herpetologists, consider it the most vicious snake in the world. The hatchlings tend to constrict small prey and as they grow, they feed on animals as large as adult antelope and crocodiles. African rock pythons have also, unfortunately, been implicated in the deaths of people, albeit very rarely. In recent years, captive African rock pythons have killed people, including one that escaped from a pet store. They do not make good pets, to say the least. The rock python is also one of the very few snakes known to to guard and protect its offspring and they do it passionately and with conviction. There are two subspecies of African rock pythons. The smaller of the two are found in our neck of the woods in southern Africa. They tend to be associated with riparian environments---near bodies of water. With that said, they can be found in a diversity of habitats from forest to savannah. The snake in the photo was killed by a leopard on our property. These pythons are not endangered, but their future is threatened by their collection for the pet trade, their skins, which are still highly sought after, and in some cases because they are hunted for food. In other instances their populations are threatened by disturbances to habitat. These snakes are also frequently killed by people because they are so feared by man. With that said, rock pythons rarely kill people, but their formidable reputation precedes them. At Zikomo Safari, we respect the rock python and give them their space. The wild snakes stay away from people, but we certainly welcome our guests to photograph them if they are fortunate enough to see one of these most impressive of Africa's large reptilians in nature. PRESS RELEASE: Celebrity wildlife conservationist and the host of ABC's Emmy-nominated wildlife program The Wildlife Docs has joined Nsefu Wildlife Conservation Foundation as a board member. The actress and comedian has spent time in both Africa and Asia with elephants and champions causes that benefit the sentient species. She has showcased conservation efforts around the world and in North America from the elusive pine marten in Michigan (her home state) to the savannah elephants of East Africa. Rachel is poised to bring a platform and a passion to Nsefu Wildlife Conservation Foundation, which develops, administers and manages conservation initiatives for Zikomo Safari located in the Nsefu sector of South Luangwa National Park in Eastern Zambia. Before joining the show filmed at Busch Gardens Tampa, Reenstra hosted "Ms. Adventure", a show on Animal Planet, which took her to some of the world's most remote places. She holds a graduate degree in psychology, which helps her interpret animal behavior for national televison audiences. Reenstra launched her entertainment career as a comedian in the 1990's after relocating from Michigan to Los Angeles. Mission: NSEFU Wildlife Conservation Foundation endeavors to combat wildlife crimes with advances in conservation technology and grassroots action. Through education and outreach, and pioneering innovations used to protect and prevent the further destruction of ecosystems and the depopulation of species, NWCF intends to be a steward of nature in Zambia. US Ambassador to Zambia Eric Schultz and his team, recently visited Zikomo Safari Camp to meet and greet Victoria, and some of our team in South Luangwa. His wife and two boys and his staff joined Victoria and Zick and Zikomo Camp staff for lunch. Ambassador Shultz was appointed to his post last year after a distinguished career in the Senior Foreign Service with his last appointment in the Ukraine. He has also served as Deputy Chief of Mission at the U.S. Embassy in Harare, Zimbabwe and held a position in Madagascar in addition to many other foreign service roles around the globe. A conservationist at heart, the Ambassador was eager to learn about what we are doing to safeguard wildlife and wild lands in Eastern Zambia. He was particularly eager to begin correspondence with Dr. Tom Snitch who serves on our board and is a leader and visionary in the elephant conservation arena. We shared that Dr. Snitch, through his innovative work with unmanned aerial vehicles, which he deploys in the war against poaching, is making leaps and bounds in the war against poachers. One of the other things we talked about was how important it is to conduct capacity buildling for local people to complement our high tech anti-poaching program. Poverty is pervasive in the area and if Nsefu Wildlife Conservation Foundation can help develop opportunities for people to embrace alternative livelihoods, we can not only reduce poverty on a local level, but we can reduce the incentive to poach wildlife for bush meat. Zikomo Safari's bushcamp sits across the Luangwa River from South Luangwa National Park. The camp offers a breathtaking view of one of the premier wildlife viewing locations in all of Africa. Elephants, hippos, giraffe, miscellaneous antelope species, lions, painted dogs and leopard top the list of magnificent mammals that make their home here in Eastern Zambia. South Luangwa is nicknamed the "Valley of the Leopard "and it certainly doesn't go by the nickname for nothing. It is not uncommon to see a leopard feeding on a kill in a tree, prowling riverine bush or boldly and unapologetically walking by a vehicle on safari. By and large, these big cats have it made here in South Luangwa. But that is not the case everywhere. Ecotourists, conservationists and other admirers of the big cat, view leopard sightings and signs of leopard as awesome opportunities to observe the activities or indicators of activities of one of the most wide-ranging carnivores on the planet. To the pastoralists tending to their herds of livestock, the leopard is viewed as a real and perceived threat to their livelihood. And many leopards are commonly killed in retribution in other parts of Africa. As humans continue to encroach and place stress on undisturbed and protected habitat and permit continued and exponential population growth, we find leopards increasingly implicated in human-wildlife conflict. Today leopards are a conservation-sensitive species, found largely in fragmented habitat. This is not to say that they are hard to find, especially here where safeguarding big cats is a priority. Indeed, African leopards have disappeared from more than 35% of their historic range, but we feel fortunate to live amidst leopards where they are locally common. Regardless of your perspective these beautiful, spotted big cats are remarkable creatures. They are incredibly strong, incredibly shrewd and incredibly variable in size, coat color and in the shape of their rosettes. Leopards are agile, highly adaptable to an array of habitats and prey species, and so cunning and nimble, that they can navigate a human-dominated landscape, and do it entirely undetected. But if you think you have seen one leopard, you’ve seen them all—you are mistaken. Leopards exhibit such variability in body size and color across not only the African continent, but across Asia. The wide-ranging Afro-Asian species is diverse in itself. In fact, 10 subspecies were traditionally recognized in Africa alone, but recent genetic studies suggest one subspecies (Panthera pardus pardus) exists on the continent, while as many as 11 subspecies exist worldwide. As recent, as the 1950’s as many as 27 leopard species were recognized worldwide, but advances in molecular genetics continue to help us document genetic diversity with greater precision. To give you some example of diversity, East African leopard populations exhibit rosettes that appear round or circular. But the populations here and elsewhere in southern Africa are known to exhibit rosettes that are square in shape. Regardless of rosette patterns and coat color, leopards are beautiful and we encourage you to visit us ASAP. Just don’t forget to bring your cameras! Rumored to emasculate its prey and sham its own death, the solitary and reclusive honey badger, also known as the "honey ratel”, is one of the most rarely observed carnivores on the African Continent and clearly one of the most interesting. The honey badger, which gained much acclaim in North America from a, perhaps, wacky and sardonic 2011 viral video parody, has been described by National Geographic Channel's Ultimate Animal Countdown, as the most fearless animal in the world. The famed parody dub of honey badger footage, originally aired by the National Geographic Channel, does showcase the tenacity and ferocity of these infamous scavengers and notorious bee hive invaders. But is it really possible to determine for certain if they are the most fearless animals on Earth? Well, they are certainly at the top of the list. In fact, according to the website of the World Famous San Diego Zoo, which is one of four zoos in the United States to have recently exhibited honey badgers, “It would be hard to find a more quarrelsome animal than the honey badger. It doesn’t start fights it can’t finish and makes an impressive foe.” And, I should add that honey badgers don’t actually feed on honey, rather they raid bee hives in search of bee larvae. In reference to South Africa’s Cape of Good Hope, the scientific name of the honey badger is Mellivora capensis and means “honey eaters of the Cape”. Yes, pound for pound, the honey badger is often considered one of the toughest carnivorans (mammalian carnivores) on the planet, because they have been known to hold their own against larger predators like lions and African wild dogs (painted dogs). People often consider the honey badger to be very destructive, some times damaging property, including unprotected bee hives and for menacing and killing young livestock. However, nothing in the animal kingdom is more dangerous than humans. In their defense, honey badgers (AKA ratels) are not commonly observed marauding the bush in search of trouble. They are, in fact, rarely seen. The ratel is found in low numbers throughout much of sub-Saharan Africa where they occur. A recent census of ratels in South Africa’s Kgalagadi Transfrontier Park indicated honey badgers may occur at densities as low as 0.03 adults per square kilometer. Sadly, they are persecuted throughout their range, which includes South Africa, Zambia and neighboring southern African countries. Unfortunately, these opportunistic carnivorans can become easily habituated to humans if permitted to scavenge on refuse in the proximity of human dwellings. Consequently, honey badgers often succumb to directed control efforts and are also, often, casualties of non-selective control programs for other carnivore species like jackals. Indeed, honey badgers are frequently unwelcomed visitors to livestock pens and apiaries. And so it is not uncommon to find honey badgers poisoned or captured in steel-jawed traps. Dangers to honey badgers are not just the obvious preemptive control programs or tactics used to depopulate nuisance species. To prevent human-wildlife conflict with species like the honey badger, Zikomo Safaris places great emphasis on securing trash and debris at the bush camp, and by protecting apiaries through modern day hive protection techniques." All visitors to Zambia need to be in possession of a passport valid for at least six months from their date of departure. Most nationals can obtain their visa at the point of entry into Zambia. Current charges are $50 for tourists of most nationalities, including US, Canadian, British and most European countries. If you are not one of the above please ask about visas before booking. Please also visit the Zambian Immigration website zambiaimmigration.gov.zm for full information. Citizens of South Africa and Zimbabwe can obtain Zambian visas upon arrival for free; for all other nationalities, tourist visas are available at all major borders, airports and sea ports. Generally, Zambia visas are priced in four different brackets, depending on the length of stay: 7-day transit visa; single-entry visa; double-entry visa or multiple-entry visa. You can drive using a UK driving licence for up to 90 days. If you intend to stay longer you will need to get an International Driving Permit or a Zambian driving licence. Take care when driving. Vehicles are often poorly lit, inadequately maintained and badly driven. Drunk driving and driving while talking on a mobile telephone is illegal. Road travel at night in rural areas can be hazardous. Abandoned vehicles, pedestrians and stray animals are a danger. Many roads are severely pot-holed or otherwise unsafe, especially during the rainy season (November-April) when bridges and roads risk being washed away by sudden floods. There are frequent fatal crashes. Don’t drive at night outside the main towns. Travel by long-distance public transport can be dangerous due to poor standards of driving, lack of rest periods for drivers, the poor quality of vehicles and poor road conditions. Minibuses used in urban areas are usually severely overcrowded, poorly maintained and badly driven. The Road Traffic and Safety Agency has recently started to more vigorously enforce an existing law to prosecute traffic offenders: drunk driving; speeding; careless driving, etc through a fast track court system. Penalties include fines and/or imprisonment.